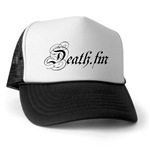 Subscribe to become a RIP member of Death.FM! Hint: Hover over buttons and album/artist name next to the cover for more info. Please log in to write reviews and submit corrections. Copyright © 2001-2019 24seven.FM, LLC All rights reserved. Comments, images, and trademarks are property of their respective owners. You can syndicate our news using the file backend.php or ultramode.txt. Robots may follow the Sitemap.